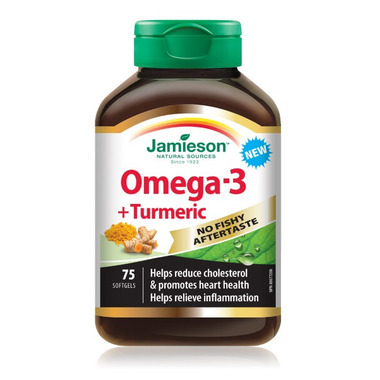 Jamieson Omega-3 + Turmeric combines heart health benefits and inflammation relief in one daily dose! Jamieson’s latest omega nutrition features a premium fish oil that is purified to remove toxins and impurities and finished with natural lemon essence to ensure a fish-free experience. No Fishy Aftertaste or burp back! Suggested Use: Take 1-2 softgels daily. Ingredients: Molecularly distilled Fish Oil 834 mg (Anchovy, Sardine and Mackerel) Providing 600 mg of omega-3 fatty acids: Eicosapentaenoic Acid EE (EPA) 300 mg, Docosahexaenoic Acid EE (DHA) 200 mg, Tumeric (50:1) extract (Curcuma longa, rhizome) 20mg. Gelatin, beeswax, glycerin, lecithin, carob, natural lemon flavour. NO starch, lactose, gluten or artificial preservatives.